This three-day course enables the participants develop the competence to master the basic Risk Management elements related to all the assets of relevance for Information Security using the ISO/IEC 27005 standard as a reference framework. This course enables the participants develop the competence to master the basic Risk Management elements related to all the assets of relevance for Information Security using the ISO/IEC 27005 standard as a reference framework. Based on practical exercises and case studies, participants acquire the necessary knowledge and skills to perform an optimal Information Security Risk Assessment and manage risks in time by being familiar with their life cycle. 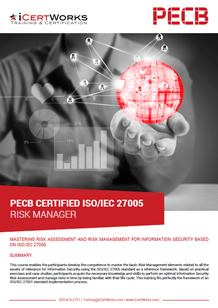 This training fits perfectly the framework of an ISO/IEC 27001 standard implementation process. Contact us about ISO 27005 Risk Manager Training!